The Samaritans, a confidential, emotional support service serving the U.K. and Ireland, launched a partnership with Facebook this past week. 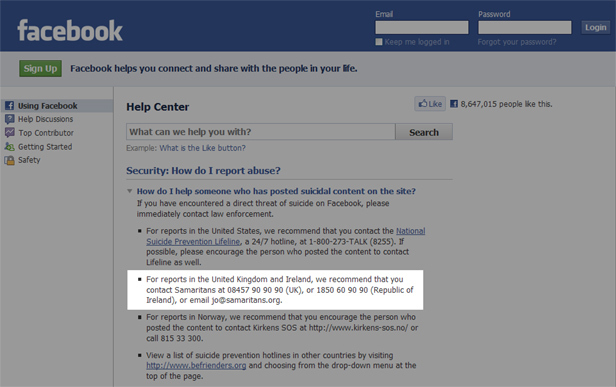 Now, any Facebook user who suspects another Facebook user may be suicidal or experiencing other emotional crises, can report it to the Facebook Help Center. Other suicide prevention organizations are also listed via the Help Center including the National Suicide Prevention Lifeline in the U.S., Kirkens SOS in Norway and Befrienders.org serving other countries. The impetus behind the move is the Simone Back case, among others. On Christmas Day of last year, Back, of Brighton, England told her 1,048 Facebook friends “Took all my pills, be dead soon, bye bye everyone.” In the ensuing hours, no one went to Ms. Back’s aid. According to The Telegraph, “Some users of the site even taunted the 42-year-old over her final status update instead of trying to save her, calling her a “liar” and saying the fatal overdose was “her choice”. Some out of town friends implored online that she give them her address and/or phone number, but by the time her body was discovered the next day, it was too late. BBC News aired a segment showing just how the system works. The mechanism for reporting is a bit cumbersome as Facebook is obviously trying to walk a fine line between having the service be too visible or too discreet. Although, in its test phase, several people reported suicidal concerns to the Help Center even before an official announcement was made. It will be interesting to see if statistics about Help Center usage for this purpose will be shared with the public and whether this will set a precedent for other social networks. Posted by Kim in Death + Popular Culture, Death + Technology, Death + the Web, Death Ethics, Suicide and tagged Facebook. Bookmark the permalink.